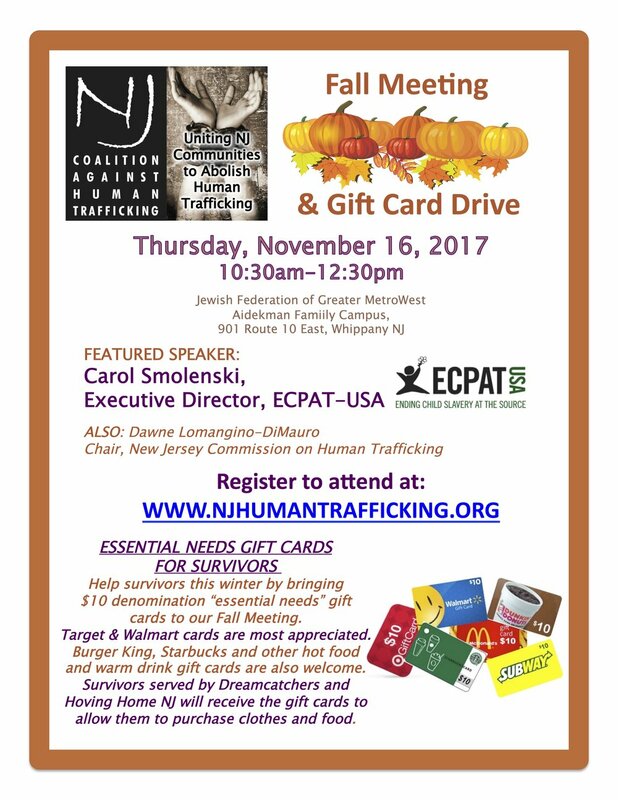 Everyone is welcome to our Fall Meeting where our featured speaker is Carol Smolenski - Executive Director of ECPAT-USA, which advocates nationally against the sexual exploitation of children. Also speaking: Dawne Lomangino Di-Mauro, Chair of the New Jersey Commission on Human Trafficking. Please bring $10 denomination gift cards to this meeting, so that we can get them to survivors before the cold season. Target and Walmart cards are most appreciated for the purchase of warm clothing. Survivors also appreciate gift cards to places where they can get a warm drink or a hot meal (Burger King, Starbucks etc).